Today I did an introduction to Hadoop at UNTELS university. The event was called Untelstronics and it was organized by IEEE UNTELS. It was programmed two hours talk. There are a lot of things to juggle before the talk, so thanks to local Linux guys in Lima for helping me to set them up. Thanks Toto, Solanch, Chavez and Brunito Avila. I started by defining what BigData is, then I pointed out the 5V of BigData. The challenges BigData is facing, the case uses, statistics related to the exponential growing data to 2020. Then I presented Hadoop as one solution to handle BigData. HDFS and MapReduce were explained in concept, as well as the architecture Hadoop. I also talked about the configuration of the master and slave nodes from my experiences and the previous knowledge required for this purpose. 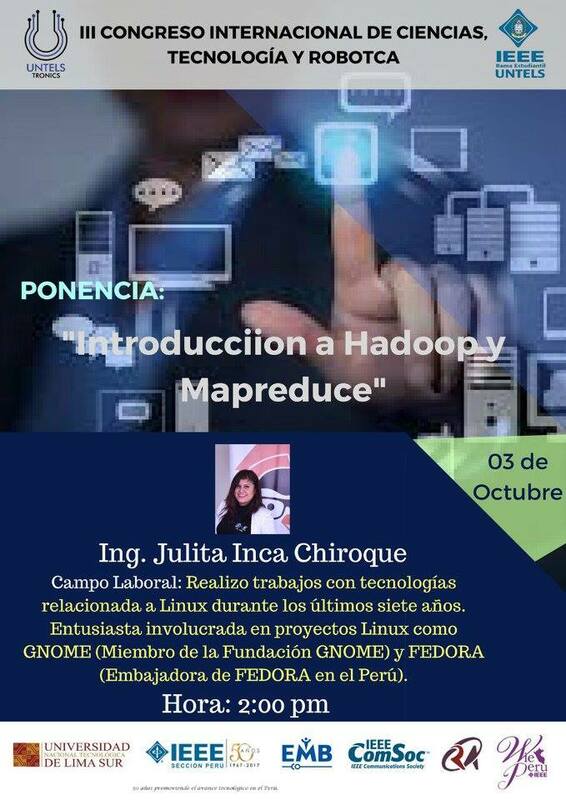 It was a pleasure to show the experience and the BigData solution on Fedora and GNOME. Thanks so much to the organizers for the invitation!